I was lucky to be at the zoo education centre last night for the launch of Geraldine Taylor and Dru Marland’s new book, The Case of the Curious Crow. The evening included readings from the book, mince pies, soft toys, photography, clippings from the Bristol Evening Post, poetry, tea, dramatic reconstructions, slide shows, damson vodka. Yes, you had to be there. The Case of the Curious Crow is a wonderful book, beautifully observed and exquisitely illustrated. 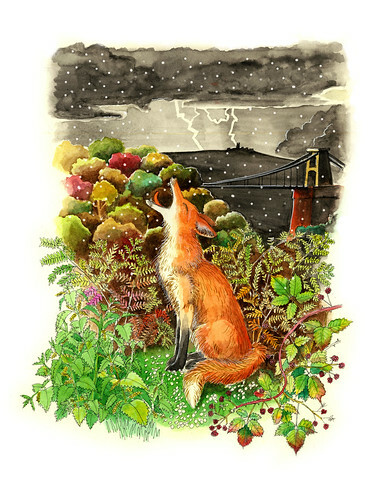 For example, here’s Dru Marland’s picture of the fox which Geraldine Taylor saw on Zoo Banks, head back, catching hailstones in its mouth. Sylvester did indeed get a maritime send off. He was ferried from the swan feeding station at Welsh Back down to the Ostrich pub, where he was buried. After a break for refreshments Keith Taylor presented a slide show about pioneering wildlife photographers, the Kearton brothers. 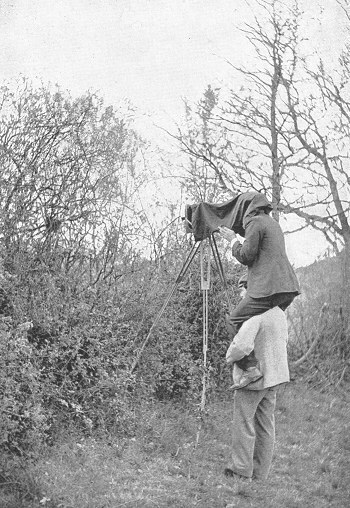 I think that’s Richard Kearton supporting Cherry Kearton for a hedge nest shot. 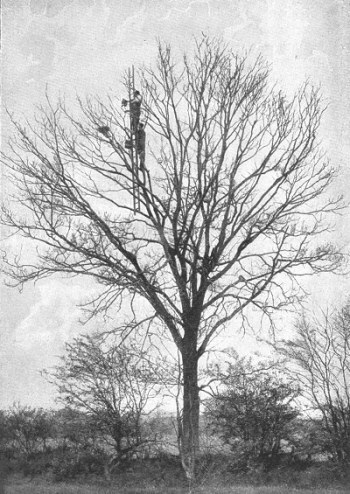 There they are again, up a tree. A quick web search found the complete text of their book With Nature and a Camera online at the Glasgow Digital Library. Like everything I encountered last night it’s packed with character. 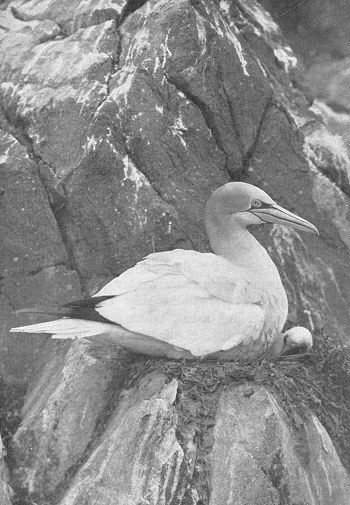 The photos of birds nesting on the cliffs of St Kilda are stunning, all the more so when you see the lengths they took to get them. And how about this for a bird-related escape? Four years ago a girl, whilst watching the men collect eggs on the Doon, had her petticoats ballooned by a sudden squall of wind, and was lifted clean over the cliff. She fell one hundred and eighty feet without a break, and alighted on a ledge which was covered with earth. The cragsmen descended to pick up what they very naturally supposed to be the dead body of the poor child, but were surprised to find that she was still alive. Her head had entered a large Puffin burrow, and the force of the blow been expended upon her shoulders. This undoubtedly saved her, and although she hung a whole week between life and death in an unconscious condition, she ultimately made a complete recovery, and was a fine buxom lassie at the time of our visit.